New Kids On The Block | News | 'THANKFUL' EP COMING MAY 12 - PRE-ORDER NOW! 'THANKFUL' EP COMING MAY 12 - PRE-ORDER NOW! NKOTB's new EP, Thankful, is scheduled for release on May 12, the same day that the TOTAL PACKAGE TOUR opens in Columbus, Ohio. 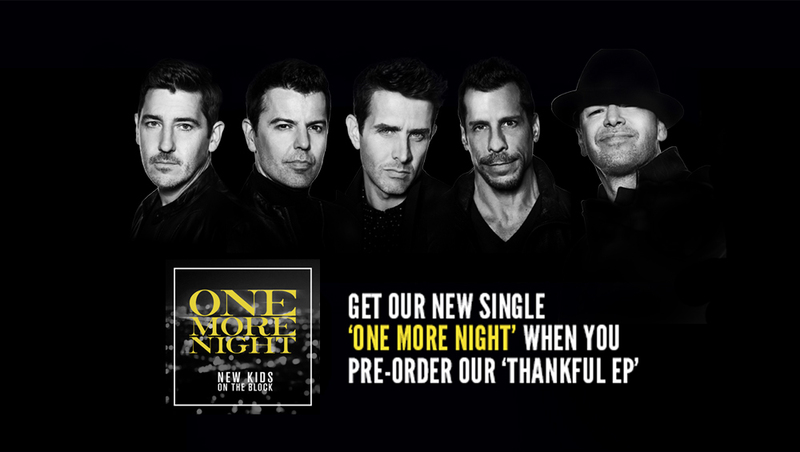 Fans who pre-order Thankful now will receive an instant download of the lead single, "One More Night," which the guys debuted on the Late Late Show with James Corden. Plus, the Target Exclusive version of Thankful will contain one extra bonus track, not available anywhere else!